My girlfriend and i really enjoyed the convention in Detroit, and i was wondering if this new contest your having will include fans outside the United States? I was also wondering if you doing any new pinups in other books? Btw issue #6 of winter was incredible!!!! I didn't have the chance to pickup #6 yesterday, but will be getting it this weekend. 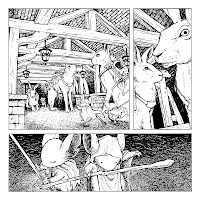 The artwork from issue #6 looks incredible, definitely some of the best Mouse Guard art yet! So many amazing pages to choose from to own an original piece of Mouse Guard art, but no money! Now that Winter 1152 is finished, and the hardcover is on the way, are there any plans for a black and white edition? I can't wait to read the conclusion. Great job, David! With winter done, any guesses how long before the trades hit? Brandon: I have talked with Archaia about a B&W version of Winter. We are watching the Fall B&W sales as part of the decision process. The other main stumbling block is the number of costly hand-inserted overlay pages is tripled in Winter. The hardcover collection is due in July. Glad to hear it's out and about! I'm sure the wait will be worth it. I'll have to head to the local comic spot this weekend and see how you wrapped the whole thing up! Today was a great comics shipping day - I got Crossed, Mouse Guard, Ignition City, and several others. (Since I work at a comic book store, the shippers walk these over to me just as soon as the Diamond boxes are delivered). Now, here's the kicker - I was diligent and kept working ... and then I forgot to take Mouse Guard home with me!. I will be picking up Winter 6 this weekend, and rereading all 6 issues. Cursed Pirate Girl will be a must as well, glad to see it finally printed. c. The overlays were nice, but I thought to thick or not adequately translucent. I didn't think they worked. e. Black is hard color to keep from scuffing on the slipcase. Congrats on finishing up the 2nd series. I think the writing in the last 3 issues was far more polished then anything you have done. The art just keeps improving. Cover 4 by far the best from both series. Congrats and I look forward to seeing you in Baltimore. See how many b&w limiteds on eBay? I just checked, I spot two. I assume there have been a fair few in the past then. Thankfully I got mine from a supplier in the UK. 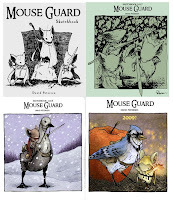 Is the Mouse Guard board game still being made?